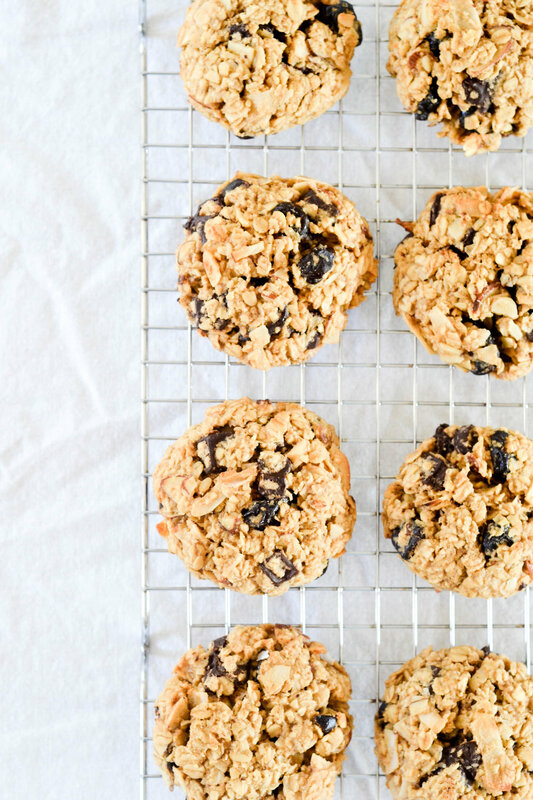 Can I get an “amen” for hearty, chewy, and densely delightful cookies? While I have a wide assortment of cookie recipes here, and of course never say no to variety, I very regularly opt for a biscuit that feels more like a meal than a delicate nibble. I find them so satisfying AND they really do make fantastic prep foods for grab-and-go treats. This particular recipe is incredibly forgiving and keeps wonderfully well. Seriously, you can still enjoy these guys a week after baking them without much changing in the way of texture and flavour. Pre-heat oven to 350F and line a large baking sheet with parchment paper. In a large bowl combine the rolled oats, flours, coconut sugar, baking powder, cinnamon, and sea salt, and set aside. In another bowl or via an electric mixer (like a KitchenAid), whisk together the egg, melted butter (or coconut oil), maple syrup, coconut milk, and vanilla extract until well combined. Add the dry mixture to the wet mixture, and stir together until fully integrated. Fold in the chocolate chunks, cherries, almond slivers, and coconut chips. Place the batter in the fridge and let cool and set for 10-15 minutes. Form roughly 1/4 cup sized scoops of batter into balls, patting the tops down a little to form a cookie shape, and spacing each out evenly on your baking sheet. Bake for about 15 minutes, until firm and cooked through, and then let cool on a wire rack before enjoying!